Woman In Digital: Is Singapore Telling Me to Go Back? Is Singapore Telling Me to Go Back? They say there's no better way to test compatibility than to travel with someone. My husband and I started traveling together at an early stage of our relationship. We have lots of stories to tell. How can I forget the day when we were running to catch our flight back to Manila. It happened not only ones or twice. How about getting lost in the city. Today, I laugh every time I remember all these things. From the many places we visited, Singapore remains close to my heart. 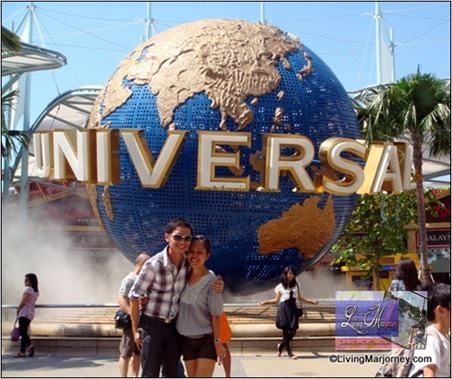 When we visited in 2012, we made sure to include in our itinerary some of the most popular attractions in Singapore, that is the Universal Studios. My shopping experience in Singapore went well when we visited Mustafa Center, Lucky Plaza and Bugis Center. It's been more than four years since then, I really hope to be back and explore other exciting attractions in Singapore. Especially after hearing the news that Singapore's Changi Airport will have a nature-inspired theme park with waterfalls and a maze - these make me really more excited. 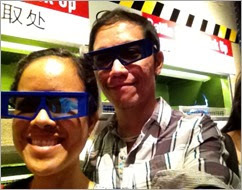 Transformers at Universal Studios Singapore! Now, here's a chance to revisit Singapore. 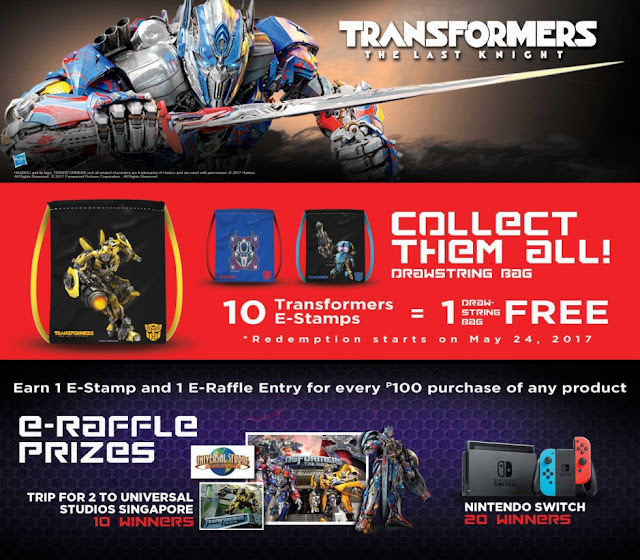 7-Eleven is giving away premium Transformers collectibles and a trip to Singapore for the ultimate Transformers experience! This exciting partnership is in time for the upcoming 5th movie in the franchise, Transformers: The Last Knight which will hit the big screen this June. Whether you're rooting for Optimus Prime and the Autobots or Megatron and his Decepticons, this 7-Eleven tie-up will get you excited for this epic film with collectible Transformers drawstring bags and even a chance to experience the excitement of Transformers first hand at Universal Studios Singapore! Collect e-Stamps which you can earn with every P100 purchase using your Every Day Rewards Card or CLiQQ App at any 7-Eleven store in the country. 10 Transformers e-Stamps will entitle you to a drawstring bag. You can also avail of the bag by collecting one Transformers e-Stamp or two CLIQQ points, add P69 and voila! The premium drawstring bag is yours! To make it even more exciting, 7-Eleven is giving its customers the chance to experience the ultimate Transformers getaway in Singapore when they collect Transformers e-Raffle entries for every P100 worth of purchase from any 7-Eleven. They can also earn additional Transformers e-Raffle entries when they buy booster products. 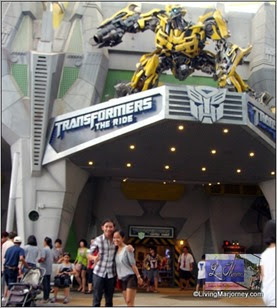 10 winners will be chosen for the trip for two to experience Transformers: The Ride in Universal Studios Singapore. Much like the Transformers franchise, 7-Eleven wants to keep everyone on their toes so 20 lucky winners will also get one of the hottest gadgets this season—the Nintendo Switch. And to complete the experience, GULP Transformer cups will also be available for the duration of the redemption period to really get you excited for Transformers: The Last Knight. There will be 10 winners of trip to Universal Studios Singapore and 20 winners of Nintendo Switch. The Transformers merchandise will be available until July 18, 2017, or until stocks last. I'm looking forward to revisiting Singapore so I better start collecting e-Stamps and use my 7-Eleven Every Day Rewards Card.